I thought it was over. That my time with the fey, the impossible choices I had to make, the sacrifices of those I loved, was behind me. But a storm is approaching, an army of Iron fey that will drag me back, kicking and screaming. Drag me away from the banished prince who’s sworn to stand by my side. Drag me into a conflict so powerful, I’m not sure anyone can survive it. 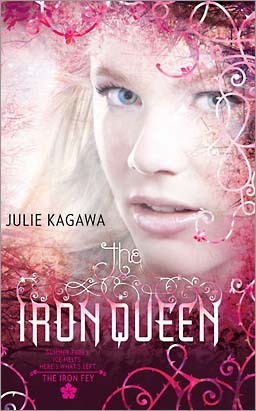 Aside from the very beginning of the story, I feel the plot of The Iron Queen is tight and flows well. The first few chapters seemed haphazard – there were many unexplained coincidences – and it took a while for the story to start making sense. There were a few flaws in the logic of the plot, and sometimes character motivations weren’t clear, but it was a good story anyway. The novel focusses on the world of the Fey as they battle the forces of the new Iron King. It was always inevitable that Meghan would have to confront the false Iron King, and the mission allowed her and Ash to assess their commitment to one another. I think they both proved their devotion to one another well, and the story captured their confusion after their banishment from the Fey. I thought it was great that Meghan finally learned how to fight, but found that the first time she was in a real battle she did too well. It is unlikely that anyone could have picked up those skills as quickly as she had. The ending of the book had been foreshadowed so strongly in the previous books that I was hardly surprised. I think the next, and final, book of the series has a lot of potential because it has been set up to answer some interesting questions about Meghan and Ash, and the world of the Fey.